Now that leaves are changing colour in the UK, it's a good time to write a story about this one. Rob Roy released a very cool network link which grabs the current leaf colour for different regions in the UK from a Forrestry web site and shows the leaf colour changes in Google Earth. Since it is a network link, all you have to do is save it in your "My Places" and turn it on and it will automatically check for changes and show you the current leaf colours. You can view his post where he announced his network link at the Google Earth Community. Now, if only some people would write Autumn Color programs for the rest of the world. Rob Roy already told me he doesn't have the time to do the US. Rob Roy is also the maker of FlickrFly which lets you fly to where your georeferenced photograph in Flickr was taken into Google Earth. ~12 Million Google Earth downloads? Where's Mac/Linux Versions? Typically, there are 15 to 20 times the registered viewers in the forums who are unregistered. From this, we can estimate there are conservatively 15X the registered users who use the forums. This equates to 2,467,005 forum users. But, one can assume there are many people who don't even use the forums. Let's say there are only 5X the forum users who have downloaded Google Earth: that leaves us with a guess at more than 12 Million Google Earth downloads. GE has been out as a beta since June. How long did it take Firefox to get to greater than 10 Million? Is this 12 million user guess reasonable? Google hasn't released a Mac Version or a Linux Version. I think this is a mistake. People who use the Mac are very visually oriented, and GE is certainly a very visual program. I would bet the percentage of Mac people who would use GE would be way higher than the equivalent on Windows. Linux is definitely a favorite for the technically oriented. My guess is pretty much every Linux user with a decent graphics card and running a compatible windows system would run GE. When Mosaic became popular, it was available on several versions of Unix. Every browser since has been released on several OSes. It would be a shame if Google didn't continue this tradition with their Earth browser. We may not know how many people are using it right now. But, it is certainly already one of the most popular programs in use today. It would gain a lot of credibility and increase its growth if it was available on the most popular alternative OSes. This is an example of using Placemarks very effectively to show a variety of different types of locations. 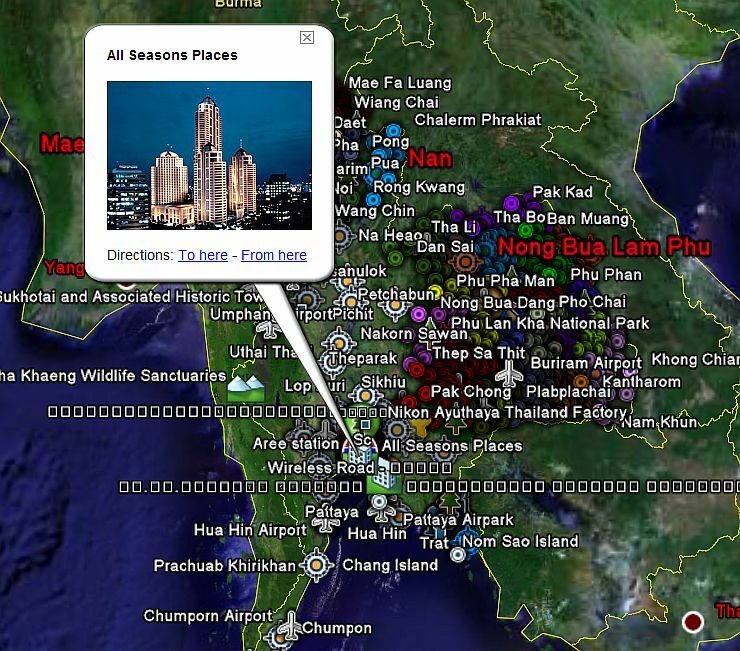 Someone named "Toko" at the Google Earth Community Forums has been posting an evolving collection of hundreds of placemarks showing the roads, hotels, restaurants, airports, parks, and other points of interests in the country of Thailand. You can download it here . Over 6000 people have downloaded what is now up to version 6.5 of his placemarks. He takes feedback from people who point out missing or incorrect placemarks, and updates accordingly. Many of the placemarks have detailed descriptions including photos and links to web sites. He has also linked to over 50 webcams (mostly in Bangkok). Some of the web cams even allow remote control for 30 seconds or so. An amazing collection Toko...great job! It doesn't take long for most people to realize Google Earth is a new paradigm for visualizing information from the Internet. You can not only put in Placemarks showing the location of things, places, news, etc. But, you can also share information (text and images) through the descriptions of the placemarks and even more importantly links to other Internet based information. With the network link you can even make that content dynamic. Furthermore, you can either use the built-in browser in Google Earth or your external browser to view web pages. I have seen some people market their web sites and through this their products in Google Earth files. But, I have yet to see anyone take the next step and actually link directly to products for sale through Google Earth. After all, buying a product is only a link away. By way of example, here is a simple placemark from the recent story I did on the Lord of the Rings showing Hobbiton - the town where the Hobbits live. 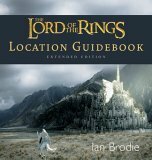 If you click on the placemark "Hobbiton" you will see that you can click on some images to either buy the movies or buy the LOTR Locations Guidebook from Amazon. One thing I discovered is that placemark descriptions do not accept IFRAME tags, so you can't use the more advanced Amazon HTML links to sell books and things. But, the more basic image links work just fine. Maybe IFRAMEs will be supported in a later version of GE. So, GE can be used to sell things. And, for the right type of application (something tied to locations) it's probably even better than a web page by itself. What do you think? The Lord of the Rings trilogy have long been one of my favorite book collections. And Peter Jackson did a fabulous job putting them on film. Last month someone at the Google Earth Community named "nzlegend" took some local knowledge, a GPS, and a LOTR guidebook, and mapped the shooting locations for the films into a Google Earth File . You can view his post here, and further down in the thread he shows the book he used to help make the map. There are certain sports which are difficult to watch in person. Examples include the Tour de France, round-the-world sailing races, paragliding races, and more. Google Earth is an ideal solution for these difficult to follow sports. I watched portions of Lance Armstrong's last race using Google Earth earlier this summer. 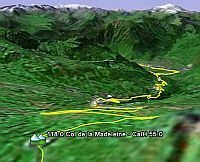 I had never realized the real extent and amazing geographic conditions of the Tour de France until someone mapped the courses in Google Earth. Although the race is long over, you can still get a feel for what it was like. You can download (large file - 350K) the course with many interesting details and actually fly each of the 21 stages. After you download it Stage 11 should be highlighted. Click on the subfolder "Tdf2005 Stage11" to highlight it, then hit the F10 key (or select the "View -> Play Tour" menu item). 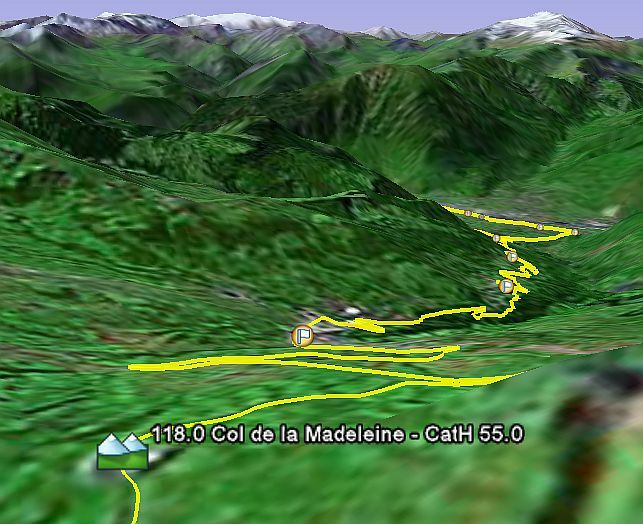 Stage 11 goes through the French Alps and Google Earth will take you through every step of the stage. The labels will tell you how much distance is left in km, and how far they have travelled in km. You can do this with all 21 stages if you like. You can also speed up the tour if you use the "Tools -> Options -> Control" panel. Just remember, even at the slowest setting its a lot faster than watching it live over 2 weeks. And, for another example, check this sport out: the Xalps Paragliding Race. I had never heard of this sport before Stefan Geens at OgleEarth did a Google Earth file to help people follow the race (he had never heard of it before either). Anyway, the race consists of several teams who each have a paraglider, a GPS, and a lot of energy. They start in the mountains, glide until they can go no further, then climb back up another mountain and go as far as they can again. Whoever gets the furthest fastest wins I guess. Thanks to the GPS tracks, you could actually view the entire race and Stefan had it updating every hour. It was a 2 day event I believe. Open this file to see how the race progressed. If you position your view and tilt angle properly you can see the gliders' tracks in the air as they glided along. I can hardly wait for Ellen MacArthur's next sailboat race. I want to follow the race in Google Earth! 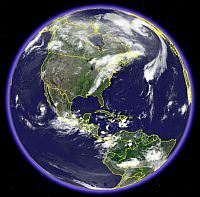 A few weeks ago I provided a link to a "Clouds of the Earth" Google Earth file which recently stopped working. This is a good time to introduce a new, and much improved GE file for showing all the clouds around the Earth. 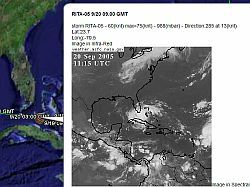 Chris Parsons wrote a script to process a global satellite map which turns the non-cloud portions transparent. The data updates once every three hours. Download the new [updated] Global Clouds . This is the closest I've seen GE appear to real satellite photos of the Earth. Chris tells what tools he is using in his post at the Google Earth Community. Amazing work Chris! Garmin has released a beta of their MapSource software which supports Google Earth directly. You simply pull down the "View -> View in Google Earth" and you can see your tracks, waypoints, and routes in GE directly. You can download the beta version of MapSource here. I was just playing with MapSource this morning and was thinking I should see if there was an update, and then I saw this blurb at OgleEarth. This new beta just continues to show how influential Google Earth is becoming. Nearly all of the primary geographically oriented software products are rushing to release convenient features to either support the GE file format (KML/KMZ), or direct access to GE. If you don't have a Garmin GPS, or don't want to download the beta, then all you need to do is save your track (or get it converted) into the GPX file format. Google Earth allows you to open GPX files and will convert them for you. This is how I've been getting my GPS data into GE for months now. 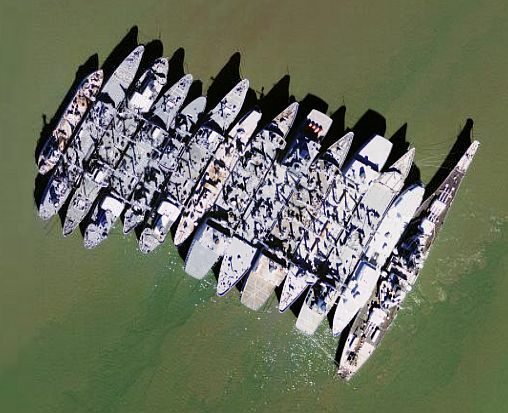 Have you ever wondered what happens to all the ships that get decommissioned? Well, I know some are sent to scrap yards and torn apart to resmelter the steel, etc. But, not all of them go there. The US Maritime Administration maintains several fleets of ships in readiness for use in what is called the "National Defense Reserve Fleet". One location in Suisun Bay, California has over 70 ships. Another fleet is located in the James River, Virginia. These ships are not all destined for scrap. The Maritime Administration says a large number of their fleet were recalled to duty during the 1991 Gulf War to transport nearly one fourth of the equipment needed during that action. They continue to maintain these ships by oiling the engines, checking for leaks, keeping the interiors clean and watertight, etc. 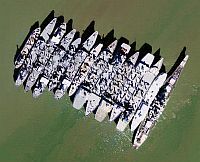 You can see these mothballed fleets here and here in Google Earth. The picture above is just a small sample of the ships to be found. This is the second time I've seen Geocaching.com owner's Groundspeak stifle innovation and very useful enhancements. OgleEarth just wrote about this earlier today. 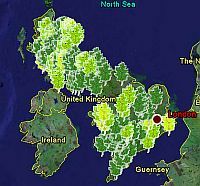 Last month I wrote an article about Geocaching Google Earth showing a very powerful script written by Andy Fowler which allowed you to see Geocaches at the Geocaching.com web site from within Google Earth. You still had to link to Geocaching.com to see the useful data, it just made it MUCH easier to visualize where the caches are located by using GE. Here's Andy Fowler's views on what they have done, and I agree with him. A few months ago I saw another web site author (I can't seem to find his web site now) which tried to enhance the ability to visualize the caches using a 2D mapping interface. He also was forced to stop by the Geocaching.com people. As a Geocacher myself, I have been very disappointed in the lack of innovation of the interface to visualize geocaches at Geocaching.com. Each time they prevent other people from offering useful interfaces, you would think they were about to release their own improvements. But, so far, they haven't. A very non-Internet approach to doing business. In the meantime, I hope some other people take Andy Fowler's script and get it running again. A team of students from the German Europen School Singapore GPS tagged a whale shark in August. They are using Google Earth to show the track of this gentle 7 meter long creature which they named "Schroeder". Whale Sharks are more whale than shark by most common perceptions. Their primary food is plankton which is why they have very large mouths so they can swim and capture large quantities of these small bits of food. Download Schroeder's track . You can see from the track that Schroeder has moved about 700 KM in the last month from the Seychelles (where they tagged him) towards the continent of Africa. This is an interesting application of Google Earth to visualize the track of a wild animal through the oceans. I expect other marine scientists who are tracking whales, turtles, dolphins, and many other sea creatures will begin to follow this excellent example for using our favorite tool. The students have created an english version of their site which you can find here. Their post at the GE Community can be found here. 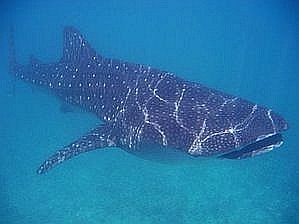 By the way, I found a link on their web site to a story that Whale Sharks are getting smaller due to overfishing. Definitely worth a read since overfishing is a serious concern affecting sea life around the world. It turns out the story I wrote a couple of days ago about finding planes in flight in GE was incomplete. The file I referenced was just for planes captured by aerial photography. There is a separate, even larger, collection of planes captured by satellite photography. See my edited earlier story with links to both collections. 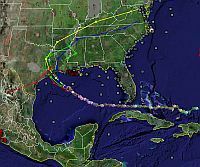 Due to Hurricane Rita, there's a lot of interest in finding tools for tracking and watching the hurricane. Normally I write stories on one application/tool at a time, but given the intense interest in these tools I'm just going to share all the main tools I have found useful. Here is my list of Hurricane weather tools from my My Places folder. You will want to open the various sub folders and explore the different types of information (satellite photos, sea surface temperatures, computer models, and more). Contained within this folder are actually contributions from dozens of individuals. You all deserve credit, but in the interest of timing I'm just throwing this stuff out. The main two tracking tools I've written about here. You can find most of these tools and other related web sites in a post maintained by a Google employee at the Google Earth Community here. In a thread at the GE Community a lot of football fans around the world are helping to identify and Placemark their football stadiums. Many of the placemarks have details and links to web pages about the stadium as well. Nearly 3000 downloads of the file have occurred and over 16,500 views of this thread with 160 replies. From ths picture here, you might get the impression that a few people in Europe are interested in this sport. Try out this collection of 1650+ Football Stadiums (found now at gearthhacks.com) around the world. This is actually another interesting way to do some sightseeing in GE. In many cases where there is only low resolution photos of the stadium, a fan has created a link to a better photo from a web site somewhere. You are likely to notice other interesting things as you zoom in on different cities. Especially if you also turn on the BBS Layer. Rather a spectator oriented form of using Google Earth for sports. But, I'm planning to write about some interactive uses of GE in sports. I've already seen some cases where the sport itself will be changed because of the ability to visualize it like never before. For aviation buffs, people fascinated with interesting pictures, or those who like to find neat objects in GE here is a nice collection of photos of airplanes captured in flight . Someone known as "AZTraveller" at the Google Earth Community has been collecting all the posted Placemarks of planes in flight and he periodically updates his collection as seen here. He has collected approximately 75 planes so far. Some of the pictures are quite interesting with planes at strange angles, just about to land, just taking off, helicopters, and more. Just open the link above and then go through the list in the Places folder. I especially like the one above which is a plane captured not far below the aircraft taking the picture, so it's in amazing detail (it's title in the list is "Amazing Airplane Capture!!!"). 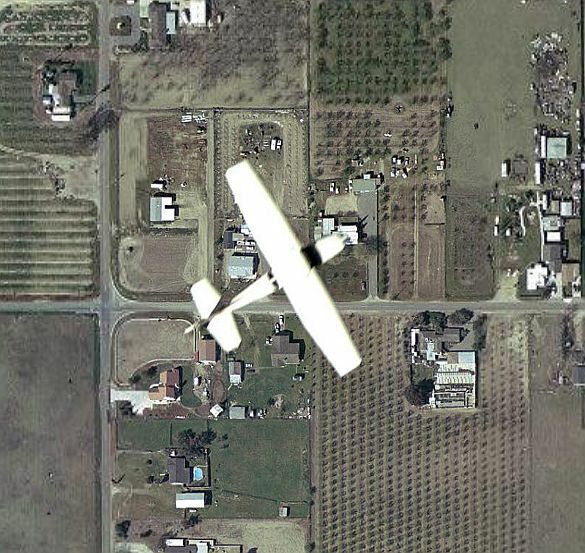 If you find your own picture of a plane in flight, first turn on the BBS layer to make sure the mark wasn't already recorded in the BBS, then post it in the "Transportation" forum at the Google Earth Community BBS. I'm sure AZTraveller will find your post and determine whether it should be added to his collection. I know there are many other planes in flight not listed (I've seen some in the BBS Layer), so there's work to be done! A new web site was announced last week which allows people to georeference WikiPedia articles. The Wikipedia is one of the grandest resources of information on the planet, created by the people for the people around the world (it's available in at least 10 languages). The new web site is called Placeopedia. 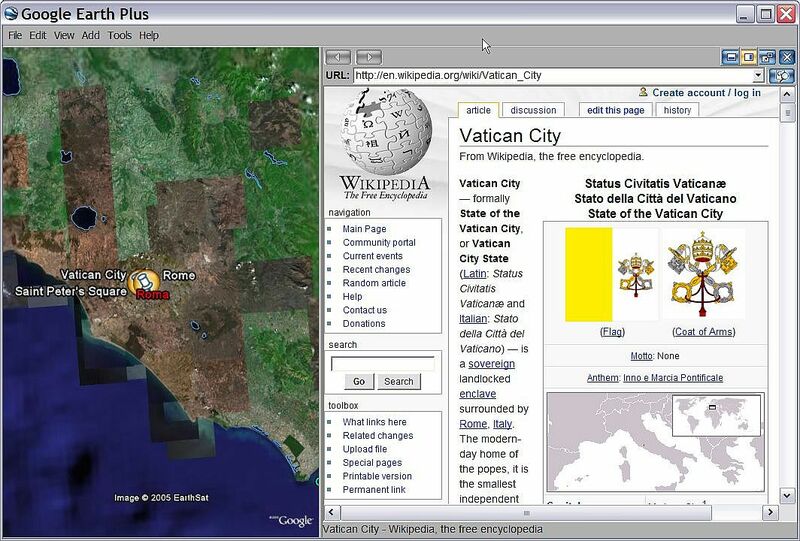 Placeopedia uses a slick Google Maps mashup interface to allow you to view "placemarks" of places linked to Wikipedia articles. Anyone can create a link (just like in WikiPedia, anyone can write or edit a story). Even more important to Ge users, Placeopedia has created a network link GE File allowing you to see their data dynamically from within GE. It uses a view based reference for accessing their place marks, so just move your view and zoom to an area to see if they have a link to a Wikipedia article available for something you're interested in. If not, you could go to their site and create a link yourself. If they do have a Placemark, simply click on the Placemark to find a link to the Wikipedia article. This is a powerful way to link a rich resource of information (the Wikipedia) to a powerful geographical visualization tool (Google Earth). My hat is off to the folks at Placeopedia. I think they have created a nice way to encourage people to help implement the enormous task of georeferencing the Wikipedia information. It won't be long before a nice consistent interface is created allowing people to link to GE from within Wikipedia articles. 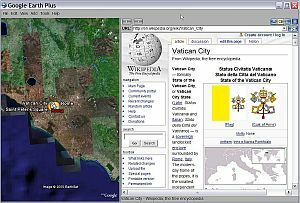 Here's an idea - when someone creates a Placemark for Google Earth, why not ask them if they can find a link to a Wikipedia article when they create it? I'm going to suggest this to Google. The Google Toolbar (after installation and restarting your browser) now has a "Search in Google Earth "
I had just thought of the need for the search in Places the other day and now my wish is granted. It's nice to see Google continuing to integrate GE with other applications. I'm going to check out the new web window features, but I suspect I will continue to use my favorite browser (Firefox). I'm hoping they fixed the bug I had found earlier which forced the use of IE when you select the "Share with GE Community" menu option...yes, it's fixed! The new National Geographic Megaflyover pictures are very high resolution. How high? 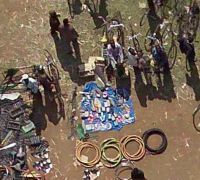 Well, in this view you can actually see the faces of people in a market where they are selling bicycles, tires/tubes, and many other recognizeable things. The people are looking up at the passing plane which is taking the picture. 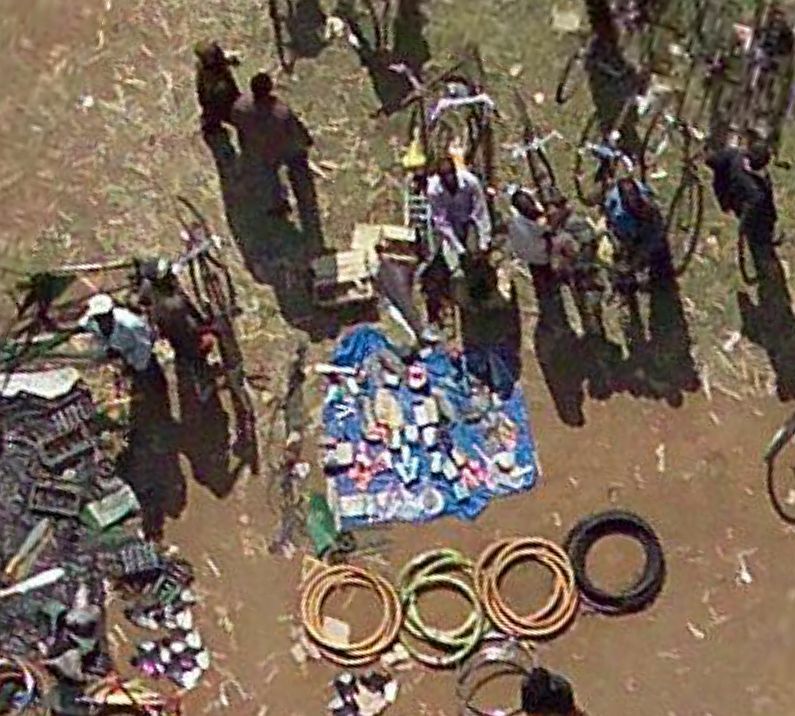 This photo is of a market near Misasi in Tanzania, and is a very colorful photograph if you zoom out and look at the whole thing. I've set the view at the maximum zoom GE will allow. This shows the potential maximum resolution of the application as it currently exists. These images are actually part of the GE primary database now, you don't even have to have the National Geographic layer turned on to see them. The only comparable pictures I've seen to date are the shots of the Google Inc. Campus in California as seen in this article where I show a ladder on their roof. 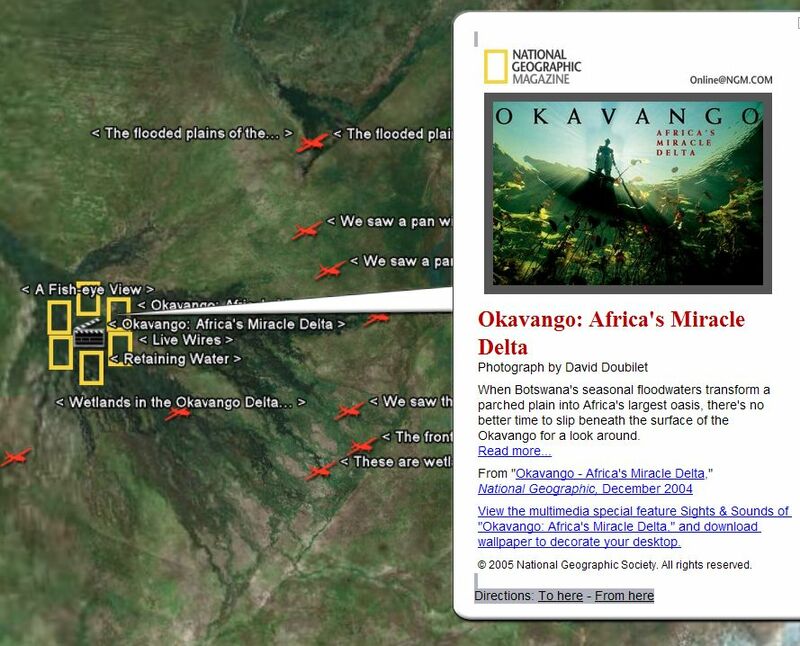 Google just yesterday made a major addition to their database layers with National Geographic Information about Africa. The layer was automatically turned on for my copy of GE Plus. If yours isn't on, simply find and click on the "National Geographic Magazine" layer in the Layers pane on the left in GE. As you zoom over Africa you will see the yellow National Geographic logos appear over different regions. If you click on these symbols you will see a photo, title, brief description, and a link to a National Geographic excerpt or entire story. These marks are georeferenced to what the article was written about of course. Even more significant, you will see lots of red "x"-like symbols (actually a little airplane) which mark National Geographics' "Africa Megaflyover" images which have been overlayed to where they were taken (you may have to zoom WAY in to see some of these). You will find photos of herds of animals, dunes, remote primitive villages, hippos, and much more. How much more? According to an article at Google's Blog there are 500 of National Geographics Mike Fay's database of 92,000 flyover images. We can only hope he will add to this very cool collection of images. 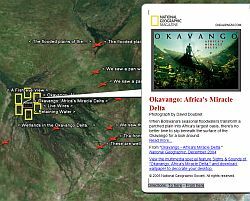 Finally, there are also links to multimedia presentations (videos and flash) showing the "sights and sounds" of Africa in various locations. This is a very significant update to the GE database that shows the amazing power of this interface for showing georeferenced information for both visual and intellectual significance. 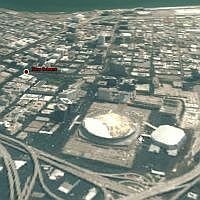 Google has just released a major database update for Google Earth which includes not only 47 new cities in higher resolution, and four cities in "very high" resolution (Jacksonville, FL 2004; Los Angeles, CA 2003; Oxnard, CA 2004;Tampa/St.Petersburg), but also a new data layer of National Geographics that indexes content from National Geographic on Africa. This is a big one folks! I will provide more detail on this exciting new data after I have a chance to review it! You can check out the announcement here. Or just start viewing the content yourself by going into Google Earth. The GE Community helped create some very valuable resources for Hurricane Katrina Victims, for official organizations responding to the crisis, and for millions of people around the world interested in learning more. There have been many stories in the news about these efforts. 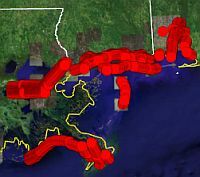 Dozens of users of GE volunteered their time to help put together valuable images of Katrina damage, Red Cross Shelter locations, and help many people who lived in the area determine whether their homes were threatened, damaged, or destroyed. In addition, the GE development team themselves put in many hours (especially over the Labor Day Holiday weekend) to create customized databases, network links, and set up massive servers to meet the demands around the world. Goolge maintains announcements about this information at this forum. A guy named 'SidneyWinstonSmythe' from London, UK decided to put Big Ben into GE. 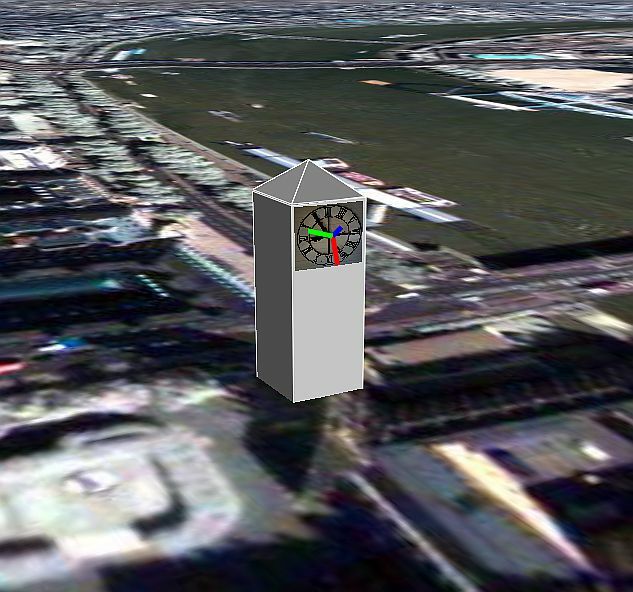 The model itself is very simple and not very realistic, but what is neat is that the clock actually works live in Google Earth! The second hand even moves. This is an application of the network link to dynamically update a drawing in GE based on time. Sid is using a PHP script to provide the dynamic data. There are many more serious applications of the network link to provide dynamic data waiting to be found out. 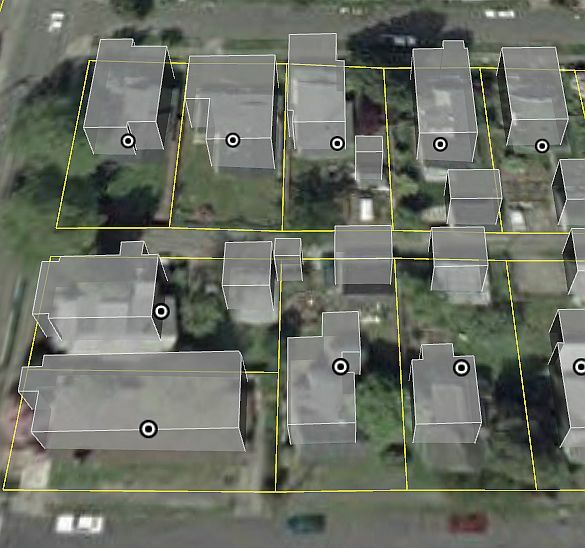 GE has only been out for a few months, and already we are seeing serious applications like what the City of Portland GIS group has been doing. In the coming months, and especially as Google Earth goes out of beta, we will see a flood of serious applications with powerful useful features reaching a global audience. You can read the thread in the GE Forums where Sid posted this application. Although, he doesn't explain very much about how he developed the application. 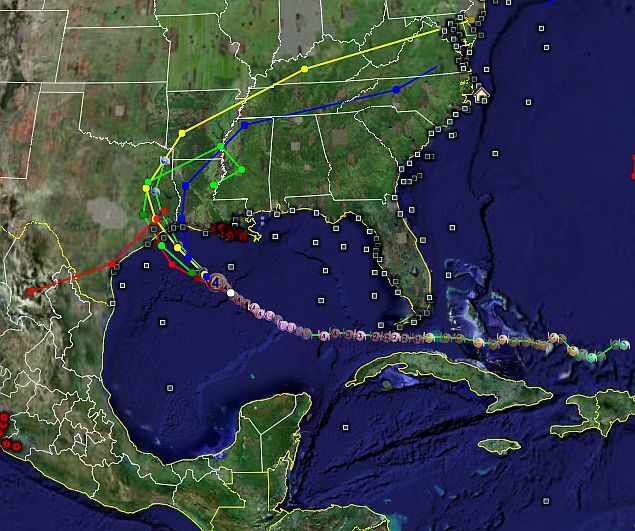 By the way, I highly recommend the network link of all Atlantic Tropical Storms kept up to date by Paul Seabury. You should make it a permanent Place if you follow tropical storm weather. You can read about it here. After you go to the asteroid occultation maps page, scroll down to an upcoming date in the table titled "Asteroidal Occultations Visible from North America" (unfortunately, this is the only area he covers for now). Then select an appropriate asteroid (say today's (850) Altona). Below the map you will see a link to "Download a-ready-to-use Google Earth points file (track.kml) for this event." Or, you can just click here to see it now . 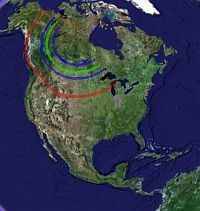 The asteroid occultation maps were created by Charlie Ridgway based on data produced by Steve Preston's Asteroidal Occultation Predictions web site. Entonces, ¿Qué son estos archivos KML y KMZ? Son el formato que utiliza Google Earth para guardar la información de marcas de posición, vínculos de red y mucho más. No voy a dar muchos detalles aquí, ya que hay excelentes documentos de referencia disponibles en Google (vean debajo). Pero déjenme describir lo fundamental. KML viene de Keyhole Markup Language (Keyhole fué el nombre de la compañía antes de que Google la comprara y le agregaran otras caraterísticas y bases de datos más grandes). Si entienden HTML/XML no tendrán problema para entender la sintaxis de KML. Pueden aprender más sobre KML en el Tutorial KML, o ver todos los detalles en la Documentación KML. KMZ es igual que KML-Zipeado. Es el formato por defecto pero comprimido. Una de las características más poderosas del KMZ es que permite que cualquier imagen que utilices - digamos íconos personalizados, o imágenes en tus descripciones - son compactadas dentro del archivo KMZ. De manera en que se pueden compartir estos archivos sin tener que hacer referencia a otros datos a través de vínculos en la internet. Para los archivos KMZ sin imágenes, el tamaño será sensiblemente menor que para el mismo archivo guardado como KML. Si entienden lo básico de HTML/XML pueden comenzar rápidamente a guardar una simple marca de posición creada como KML, y ver el resultado de ese archivo de texto. Si eres un programador probablemente te facinará el tema de los vínculos de red. Los Vínculos de Red son una de las más poderosas características de GE, permitiéndole hacer referencias dinámicas a datos en un servidor externo en la Internet. Al igual que en la creación de páginas web con ciertas herramientas dedicadas a eso, no es necesario aprender a programar en KML/KMZ para hacer cosas y poder verlas en GE. Se pueden hacer marcas de posición, imágenes superpuestas y muchas más desde la misma interfaz de GE. Here's your chance to re-live my last couple of hours of GE research. I thought I would share some of the things that interested me as I explored Google Earth information this morning. Here are the last 5 interesting GE-related things I examined or created. None of these seemed interesting enough to write a story on, but I thought they were worth sharing. Subject: "Google Earth threatens democracy"
Since Google Earth has been released as a free application numerous people have expressed concerns over the availability of such data for either individual privacy or the possibility of terrorists using the satellite photos. These concerns have been invalidated by the experts. But, Jonathan Crowe, at the Map Room, has posted an excellent summary and conclusions on these issues. He gives a lot of credit to Stefan Geens at Ogle Earth who has been following the news stories about various countries that have expressed initial concerns (until the concerns were invalidated). 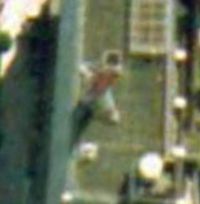 Recently someone posted this placemark showing what looks like a guy standing near the edge of a roof on a building near Tokyo, Japan. I say "looks like" because this obviously can't be a man as he would be 50 or 60 feet tall according to my measurement estimate. It really is a weird shot though, and quite amusing when you realize its not real. This is some kind of suggested visual anomaly and a by-product of a photo resoution problem. You may not see a man in the picture if it wasn't suggested to you first. I remember when NASA scientists thought they had found a "face" on the surface of mars in the 1980s. A later mission took a higher resoultion picture and you could tell it was just a product of rocks and shadows. But, the original picture certainly seemed very much like a human face. Here's a link to a face on Mars story. Cover Story in Technology Review - "Killer Maps"
Technology Review (a magazine by MIT) has a cover story called "Killer Maps" on new Internet mapping technologies highlighting Google Earth. This is an excellent story not only highlighting Google Earth, but also talking about the interfaces (APIs) Google and other mapping tools are creating allowing programmers to customize the maps. This is a long article with lots of examples of how these tools are being used. The first "page" is dedicated to an example of Google Earth being used to plan a trip to Chicago. You can read the article here on their online magazine, or buy their magazine at the store. This is an excellent article! 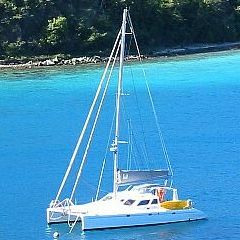 A couple of years ago we took a sabbatical and sailed our catamaran PatiCat from the US to Bermuda, down through the Caribbean islands, back through the Bahamas, and finally back to the US. This was the realization of a life-long dream. While on the trip, we documented our journey through a web site with lots of photos and stories. I had generated some maps showing various parts of our passages, but I always felt it was an inadequate way to demonstrate where we were. That remained true until Google Earth came out. Although we had GPS and electronic charts for navigation, I regretfully did not have a direct interface to my onboard computers to record our exact paths. So, for the past several weeks I have been spending a little time each day recreating our passages and anchorages using our logs, journals, and Google Earth Plus. (Notice to Mariners: do NOT use my data for navigation purposes as it is only approximate and not based on navigational charts - just satellite photos). It's still not a completed work (I haven't finished the passages on the way back), but its close enough for sharing. Once you've loaded my Google Earth PatiCat file , you will see that each passage is a different color (only a few of the passages are multiple day passages - like out to Bermuda). The interesting thing about this work is that I have created links and information for the anchorages to web pages at our PatiCat web site, which describe our visit there or even interesting details about the anchorages and what to do nearby. 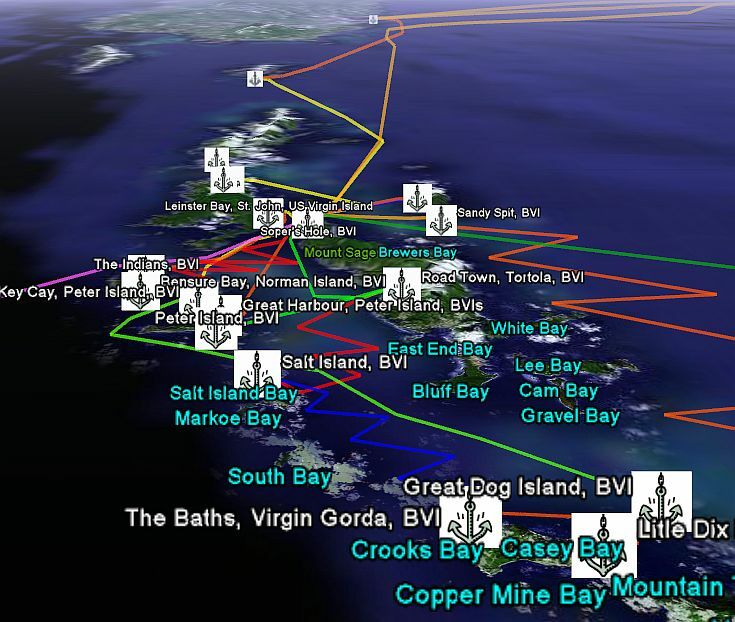 So, in effect, its like a Google Earth cruiser's guide for the areas we sailed in the Caribbean, Bahamas, and Bermuda. 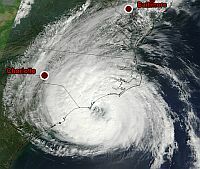 It is deceptive how much information is here (for example, zoom in on Beaufort, NC to see how we left the fuel dock and transited the waterways to the sea. I would love to hear from other sailors who are using Google Earth, or from anyone who thinks this is interesting. You can visit our PatiCat web site at: www.paticat.com to read the whole story. We sold the boat a few months after we returned in order to return to normal life. My wife and I plan to buy a new boat in a few years (after the kids move out) and do a circumnavigation. Next time we will use Google Earth (or its successor) to more accurately document our trip. We may still not cover seven seas, but it will still be another adventure! Footnote: the long purple line from Cape Town is when our boat was delivered from South Africa to the BVIs (I hired a delivery captain for this and chose not to go with him even though it only took 31 days - which is fast for a sailboat that used practically no motor time during a passage of 5700 nautical miles). An ambitious project started at the Google Earth Community Forums by someone called jeffryv provides tours of placemarks of all the major cities around the world. He is systematically adding interesting details about each city (about 50 of the top 100 cities so far). You can view his post (a lengthy one) with lots of details on the cities of the world. Or, you can go straight to download his current GE File of the top 100 cities file . Once you have brought up his 'top 100 cities" you will see it in your Temporary Places folder. Open the folder to see how he has it organized in groups of 10 cities. You can select a folder and then select Play Tour (the button that looks like Play on your TV remote, or hit F10, or the View->Play Tour menu choice). Or, you can just double-click each city in the folder to fly to it. I think jeffryv should add links to something like the Wikipedia for each city for even more details. But, it's a great start and a big undertaking. It's also a nice way to learn some geography about the major cities of the world. Great job jeffryv! 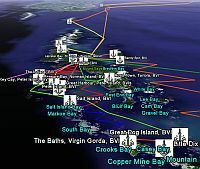 There are a variety of mapping mashups (mapping hacks) which provide a way to link into Google Earth. But, sometimes you would like to take your currently viewed coordinates in Google Earth and view them in another mapping tool on the Internet. A guy named Barry Hunter posted at the Google Earth forums about a link between Google Earth and mapping sources. His post points out some nice mapping tools at Nearby.org.uk. First, you need to download this GE File Nearby linker . Once you have this loaded, a placemark called Nearby will appear after you have paused your view (you can turn this on and off in your Places list, I suggest moving it to your My Places folder for future use). 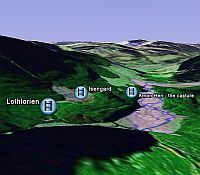 Select the Nearby placemark and choose either "View at Nearby.org.uk" or "Google Maps" . The Nearby site will let you choose from a variety of mapping sources to view your location, or you can go straight to Google Maps with your current view. Very nice, and a very useful tool! It turns out Barry Hunter authored these tools (although he doesn't mention himself on his web pages). You can read about his Google-related tools at the link he provided on his Nearby.org.uk site here. As mentioned here before, Google Earth allows you to import 3D models and place them where appropriate. If you look at some of the sightseeing web sites listed in my reference section, you are sure to find a number of interesting 3D models. This is yet another way to help make your experience in Google Earth seem more real. 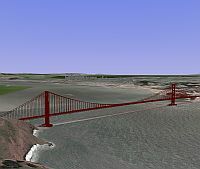 My two favorite 3D models are the Golden Gate Bridge in San Francisco, and the Statue of Liberty in New York City. Others I've seen done are the Eiffel Tower in France, the US National Monument, St. Louis Arch, the Pyramids in Egypt, and Stonehenge. See if you can find some interesting ones by going to some of the sightseeing sites I've listed in the reference section. Google was given permission to provide overlays from a Monday night assessment of damage done by the Federal Emergency Management Agency (FEMA). This overlay shows the areas FEMA has assessed so far for flooded areas, light damage to catastrophic damage in a graphical fashion. You can download the overlays here or read the Google Earth team's post here. NOTE: Google says you may need a more recent graphics card or at least more recent graphics drivers for this to work properly. A new version of Google Earth is out. It is a minor bug fix update to version .0548. See the details on the fixes in the post at the forums here. The New York Times has written an article (you can see it at CNET here or at the New York Times) which talks about the way the Google Earth forums has responded with these images and helped hurricane victims and potential victims check on the damaged areas in Google Earth. Here's another story by Forbes. And here's a story by the BBC on the topic. A woman named Kathryn Cramer has dedicated her time during the past week to helping hurricane victims with information using Google Earth and her blog. She's is mentioned in the above stories. She has posted links to several stories around the world she's heard about on these topics here. The City of Portland has added a slick new addition to their GIS information which I wrote about earlier. This new capability shows building property outlines as transparent 3D polygons as well as the parcel/property outline. Make sure you use the tilt capability to see this best. You can move your view around to other parts of the city and it will automatically load another area of the city. It can't load too large of an area at once as it will be too much information. Download the file here to see it in action. This is really slick stuff, and other cities should be paying attention to the City of Portland, which is leading the way in showing how GIS information can be put into the hands of the world (literally). My hat is off to the GIS team at the City of Portland! Here is the City of Portland's post which includes details about how they are doing this. 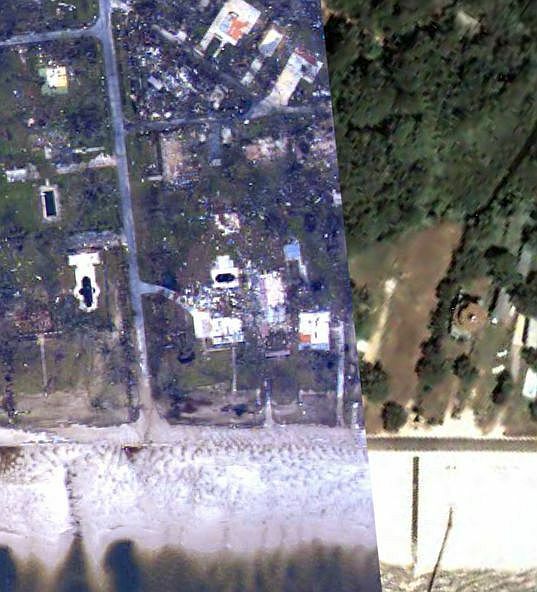 Google has started releasing image overlays of damage from Katrina for Google Earth. They made the announcement here and on the Google Earth home page. You can really see the before and after differences with these images (you can turn the images on and off to do comparisons or slide the transparency slider on and off). The GE developer team mentioned they realize some of the user-supplied images are just as good or better right now. But, these images are placed on hefty servers with mega bandwidth, so they should be more reliable than some of the other sources. It seems to me Google could make these images available through the Layers fairly easily. I don't think it would be a good idea to change the primary database with these images as hopefully the signs of destruction will go away over the coming months. Although, I'm sure the buildings and economies will take years to rebuild. 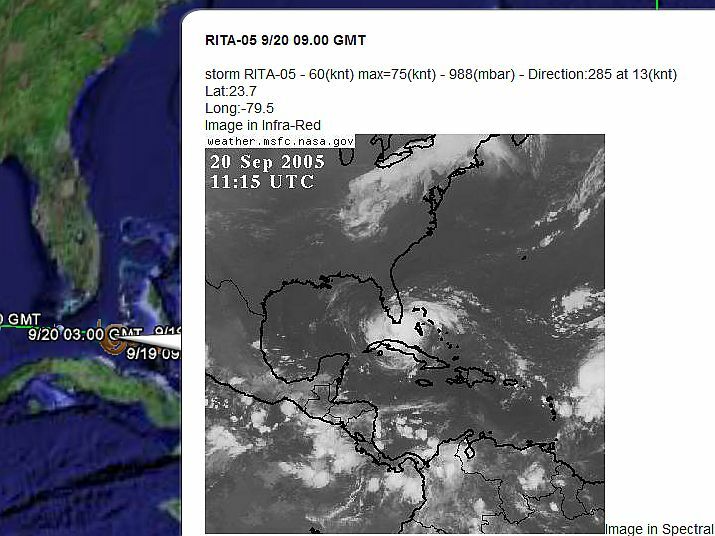 These are some of the first of what I assume will be many image overlays showing the terrible damage done to the Hurricane Katrina ravaged areas. This is an overlay of one of the new Digital Globe images taken recently showing the flooding and damage in New Orleans. The overlay was posted here at the Google Earth Forums. 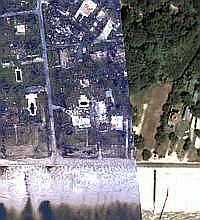 NOTE: these are photos being placed by users of Google Earth, but are placed in the proper coordinates. They are not officially part of the Google Earth database. Here are some horrifying overlays from Bay Louis, MS from another post here. Turn on the different photos in the Places sidebar - it will take a while to load each of these images (even longer if their server gets overloaded). These high resolution pictures show awful paths of destruction through this area of Mississippi. It's like a hundred tornados came though here. 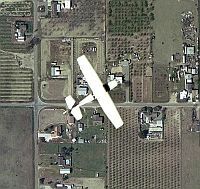 DigitalGlobe, Google and GlobeXplorer (www.globexplorer.com) are working closely to provide the updated imagery via Google Maps, Google Earth, and the GlobeXplorer suite of products including ImageAtlas as quickly as is possible. 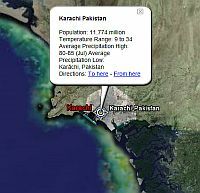 As soon as this data is made available, I will post an announcement here at Google Earth Blog. See this entry for a video of the demolished region tied to placemarks in Google Earth. 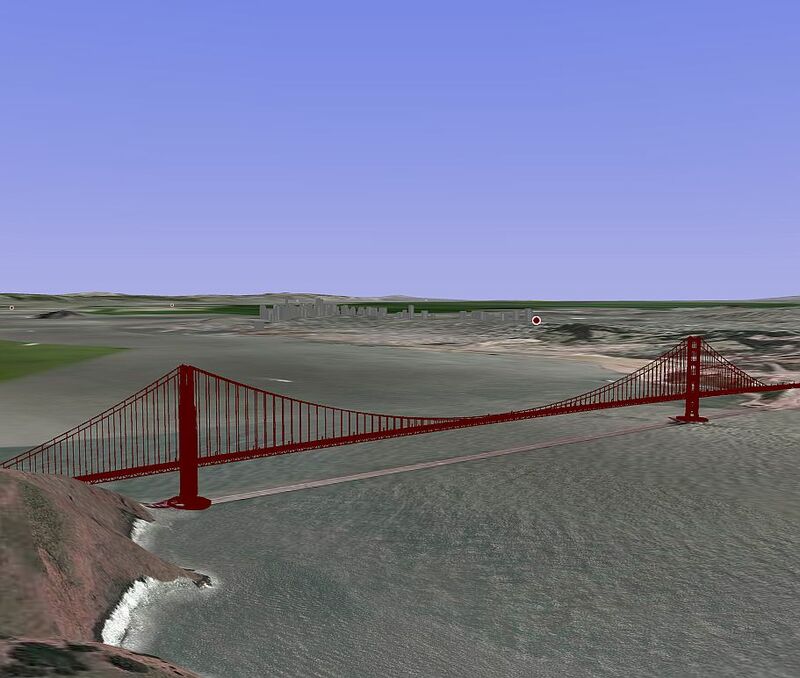 Imagine running Microsoft Flight Simulator and Google Earth together. 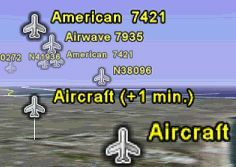 Imagine seeing your simulated plane, and other auto-generated planes, appear within the Google Earth. Turn on the roads layer, the airport layer, etc. and you can see all kinds of data associated with where you are flying that the Flight Simulator does not. These are just the simple by-products of a free application announced in July by Juergen Haible (http://www.elbiah.de/). His application is called MyFSGoogleEarth and you can find it, along with instructions for installing it here. This is a program for the more serious Flight Sim user and requires at least the free version of FSUIPC. As Google Earth becomes even more useful (in terms of data and interface), I expect there will be even better interfaces between GE and MS Flight Simulator in the future (despite the rivalry between Google and Microsoft). Great job Juergen!